Houston, TX - Saturday September 23, 2017: Amber Brooks during a regular season National Women's Soccer League (NWSL) match between the Houston Dash and the Chicago Red Stars at BBVA Compass Stadium. EDINBURG — Before the Houston Dash arrived in Edinburg, Houston Dynamo President of Business Operations Chris Canetti wanted to make sure the players knew they would be making a measure of history. 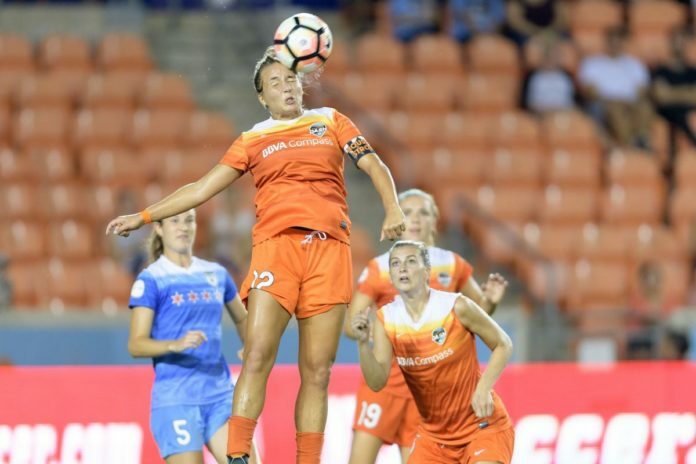 The Dash will face the North Carolina Courage in a National Women’s Soccer League match at 7 p.m. Wednesday at H-E-B Park, making up a contest originally scheduled for Aug. 27 in Houston that had to be postponed and relocated due to Hurricane Harvey. The game is believed to be the first professional women’s team sport event to be held in the Rio Grande Valley. The 10-team NWSL is in its fifth season of competition after being established in 2012. The Dash, which is operated by RGV FC’s parent club, the Houston Dynamo, joined the league in 2014. Houston is eighth in the NWSL standings with a 7-13-2 record, already assured of missing the playoffs with just two games remaining on the schedule. North Carolina ranks atop the standings with a 15-6-1 record, looking to defend a championship the franchise won last year playing as the Western New York Flash. The NWSL is home to many of the top names in women’s soccer. Carli Lloyd, a Dash midfielder, was the FIFA Player of the Year each of the past two seasons and helped the United States to a pair of gold medals and the most recent World Cup. Lloyd’s status for tonight’s game remains unclear, however, as the Houston Chronicle on Sunday reported that “it appears” Lloyd will not play again this season due to a left ankle sprain suffered during a match Aug. 13. Garcia said he had wanted to bring a Dash match to the RGV for some time, and Canetti said he was open to the possibility of playing future matches in Edinburg. For the Dash, the road trip for a home fixture is a chance to expand the team’s reach to a different part of the state.